If you were to ask me what my number one, go-to, last-minute pasta dish is, I wouldn’t hesitate to say spaghetti aglio e olio. If you were to ask me what my number one, go-to, ridiculously-easy, don’t-feel-like-standing-in-front-of-the-stove pasta dish is, I would say this: Marcella Hazan’s four-ingredient tomato sauce. This dish has made the rounds on the food blogs already, so you’ve probably already seen it, unless you’re living in a hole. But if you’re out of the hole just to visit mine, hello! Welcome! Boy do I have a revelation for you. I am guilty of many things, and one of them is over-flavoring my tomato sauce. In the winter, I love throwing in a ton of herbs and spices, garlic, onion, and balsamic vinegar. But what I learned from Marcella Hazan is that tomato sauce can be rich and flavorful with nothing but butter, maybe some salt, and onion — and the latter isn’t even included in the final dish. It’s fished out before serving, leaving only its essence behind. I can hear your eyebrow rising precipitously towards your scalp. You probably think it’s crazy. But no! The trick is in a kind of long, but relatively short, low simmer. Forty-five minutes in a saucepan is all it takes to concentrate the flavor of whole tomatoes and onion. The butter melts, leaving it creamy, velvety. 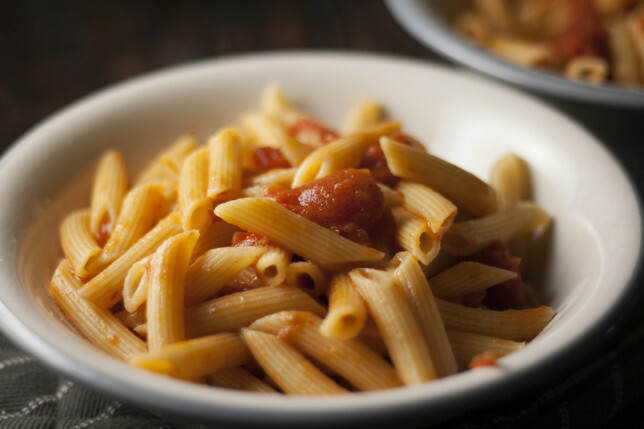 Tossed with the pasta of your choice, this sauce requires no basil, no black pepper, no parsley. A grating of parm is always welcome, but is by no means mandated. It is, as intended, Italian simplicity at its best. 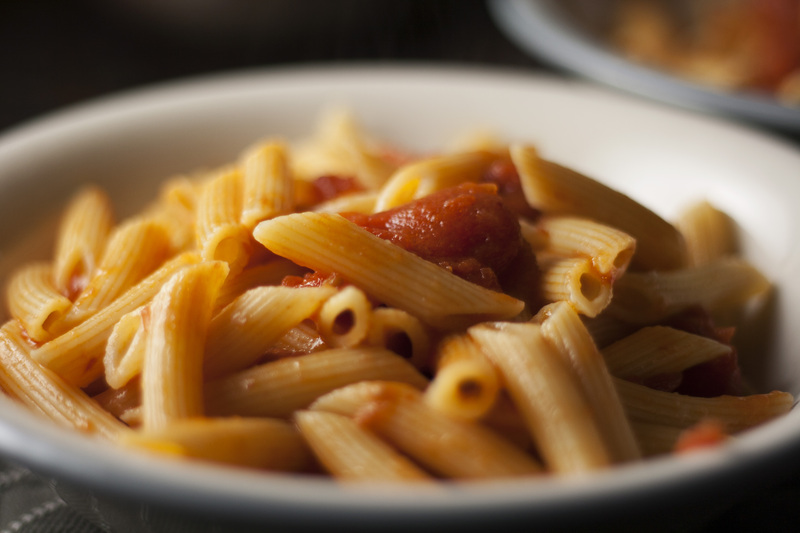 This recipe makes enough sauce for about a pound of pasta. As you throw it all in, you’ll be questioning the wisdom of this measurement, but truly, the flavor is so concentrated that it works. But, of course, feel free to use less if you’re wary. Pro tip: cut up the tomatoes in the can with a pair of kitchen shears before adding them to the saucepan. Makes them much easier to break up as they cook. 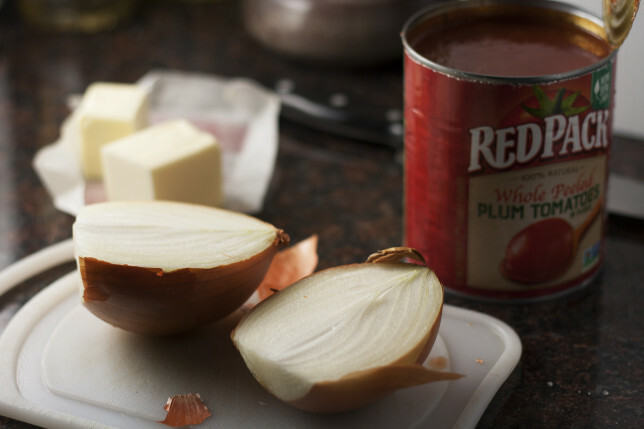 Add tomatoes, butter, onion, and a pinch of salt, to a medium saucepan. Bring to a simmer over medium to medium-low heat. Cook, stirring occasionally and breaking up large pieces of tomatoes against the side of the pot with a wooden spoon, for about 45 minutes. Remove onion, add whatever pasta you’ve cooked in this time, and toss. Serve plain in warm bowls or with a grating of parmigiano-reggiano.